The lives of nuns can be surprisingly rich, and not just with spiritual experiences. Far from living out their existence in convents, these women can do amazing things. Historically, they have left behind mysterious cases of satanic possession and also worked on some of the greatest scientific projects. Modern nuns experience miracles, save endangered species, and allow scientists to scan their brains to find a phone line to God. However, some orders have stepped outside of the law in surprising ways. Others, despite appearances, aren’t even real nuns. In 1839, gravediggers were working inside Romsey Abbey, near Southampton in England. The men found a casket under the floor. Inside, a braid of hair rested on a pillow carved from oak. In some places, pieces of scalp still clung to the hair. There were no other remains, except for a finger bone. However, the gravediggers said it turned to dust the moment the coffin was opened. In 2016, researchers analyzed the hair. The hope was to find clues about the person’s identity. Two specific candidates are nuns who once lived at Romsey; Saint Morwenna and Saint Ethelflaeda. Tests suggested the person died between 895 and 1123, a good match for both women’s lifetimes. Additionally, the owner of the braid consumed a lot of fish. This tidbit was important. Since monastic life frowned on meat but not fish, this strongly suggests that the hair belonged to a nun and not a villager. It may be the only clue that this person was even a woman, since gender remains uncertain. However, Romsey had always been a refuge for nuns. Some of the world’s oldest monasteries exist in Amorgos, a rustic island off the coast of Greece. The buildings teem with monks—and one nun. Her story is unusual. Called Sister Irini, she never reveals her real name or much about her old life. Some facts are known, however. She first visited Amorogos as a tourist around 35 years ago, bringing along her family. The island’s beauty and slow pace made a deep impression on her. Years later, after her husband died and the children were grown, Sister Irini took her vows in 2011. The Greek Orthodox nun returned to Amorogos. She moved into a long-abandoned monastery and renovated it. A striking feature is the garden she created single-handedly. The rest of the island is parched, but the nun’s green oasis boasts frescoes and 30 fruit trees. Sister Irini remains the only nun on Amorgos and welcomes visitors year-round at “her” monastery, called Agios Georgios Valsamitis. Although she lives alone, the nun also receives weekly visits from monks who reside at the famous monastery of Hozoviotissa. Sister Kate Costigan is one of only two nuns in the world with a black belt in karate. She also drives a motorbike in rural Tanzania to fight HIV and AIDS. For the past 20 years, she has educated villages to break down the stigma and created support clubs. Rural Tanzania is hard-hit. Gender inequality in particular leads to more women with infections and full-blown AIDS. The remoteness of the region also makes it difficult for patients to walk to clinics to get their tablets. For this reason, the Irish nun, belonging to the Sisters of Ola, bikes with a special passenger. Clifford Samuel is a pharmaceuticals executive. The company he works for created cheap drugs for mass distribution. Costigan and Samuel provide both tests and medication as a part of the World Health Organization’s strategy to stop HIV. According to the WHO’s 90-90-90 campaign, if 90 percent of HIV-infected people know they are positive, 90 percent of that group receives treatment, and 90 percent of those stick to their medication, the disease will stop spreading. In Northern California, a sisterhood grows cannabis. The women take vows, live in a compound, work, and pray together but are not affiliated with a religious order. While they prepare the plants and churn out a line of fast-selling products, the women also wear habits. 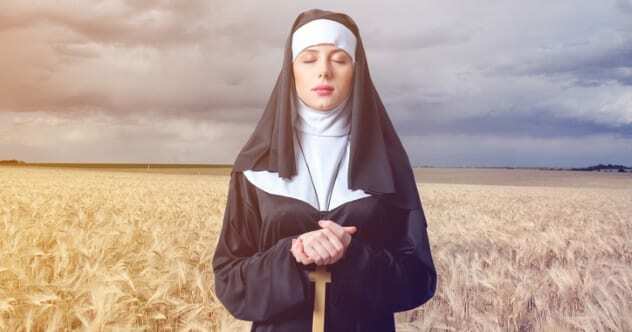 Called the Sisters of the Valley, the “order” supports female empowerment, the healing properties of weed, and socialism. The strains developed on the farm are considered hemp. This means the plants cannot make a person high but still retain the healing CBD properties. The self-styled nuns enjoy smoking the occasional joint, although it is not clear whether they get high on them. The growing field of cannabis-based products has piqued the interests of giants like Coca-Cola. It is estimated that by the year 2020, the hemp industry will generate $2 billion. The sisters find this plausible, considering the success of their own business. In one year, their sales totaled $1.1 million. Their best product, a salve for aching joints, earns $3,000 per day. The purpose of each area that did light up was already known, including emotion, body representation, and self-consciousness. Activity in such areas might foster the illusion of being one with God. One spot stood out, though. The caudate nucleus is believed to activate feelings of romance, happiness, and parental love. This area could have spawned the unconditional love and ecstasy the nuns experienced. In 1887, a bold project was born. In Paris, 56 scientists from 19 countries agreed to map the entire night sky. To accomplish this, they had to count the stars on 22,000 photographic plates. The work, one of the largest scientific studies of its time, was divided between different institutions, among them the Vatican Observatory. Back in the day, the field of astronomy employed women but kept them in the background. Many of the male project managers never counted a single star but instead hired female teams at minimum wage to do their work for them. The Vatican was no different. It recruited four nuns. History books showed photographs of them at work but never mentioned their names. Their contribution was never recognized, either, despite the immensity of it. The quartet mapped the locations and brightness of close to half a million stars. In 2016, a Jesuit priest was organizing the Vatican Observatory’s archives when he finally found the names of the four nuns: Sisters Regina Colombo, Emilia Ponzoni, Luigia Panceri, and Concetta Finardi. A rare salamander lives in Mexico. Around 100 remain in the wild inside Lake Patzcuaro, for which the species is named. These salamanders are related to the similarly critically endangered axolotl. Thankfully, for the past 150 years, a Dominican convent has managed to raise more. Not only do they provide a full-time staff to look after the amphibians, but they also maintain a healthy population. At the moment, around 400 Lake Patzcuaro salamanders remain under the care of the nuns in what may be the first conservation project ever undertaken by a religious group. The 23 women take turns to live in groups of three or four at the breeding facility. The salamanders are spoiled with organic earthworms and regular water changes to keep their tanks fresh. Each animal is microchipped and receives a carefully selected mate. Years of experience have endowed the nuns with the ability to distinguish the best-quality salamanders for breeding. (They look pretty much identical to the untrained.) Small populations are bred elsewhere in the world, but the convent’s stock is considered the most genetically viable and healthy. Isabella Tomasi was 15 when she entered a convent in Sicily. Once accepted into Palma di Montechiaro, a Benedictine order, her name changed to Sister Maria Crocifissa della Concezione. In 1676, the other nuns visited Sister Maria’s cell and found her on the floor. Bizarrely, the 31-year-old’s face was smeared with ink, and she clutched a letter. For 300 years, nobody could read what the nun claimed the Devil wrote using her hand. The only recognizable word was Ohime, which means “oh me.” This was an attempt to refuse the Devil’s demand that she sign his letter. In 2017, scientists fed the enigmatic markings into a cutting-edge code breaker. The result was interesting. Sister Maria wrote in shorthand, using a unique vocabulary gleaned from Latin, Greek, Runic, and Arabic alphabets. Even deciphered, the content was garbled. A few sentences made sense, including one that called the Holy Trinity a bunch of “dead weights.” Since historical records said the nun fought the Devil on a nightly basis, researchers believe she was likely suffered from bipolar disorder or schizophrenia. The Missionaries of Charity’s claim to fame is Mother Teresa. After her death in 1997, the care centers she founded in India continued to serve the needy. The Roman Catholic order also cares for pregnant unmarried women. In 2018, a bombshell dropped—the Missionaries were implicated in the sale of four babies under their care. Only one was recovered and reunited with his mother; he had been sold for $1,000. Several facilities were searched, and one shelter for unwed mothers was shut down by the police. During the crackdown in the city of Ranchi, a nun and staff member were arrested, and the police claimed the latter confessed. The staff member, Anima Indwar, was also the one who opened the can of worms. A child was sold for $2,000, but after Indwar never delivered the infant, the infuriated couple who paid the money went to the police. Soon afterward, it was discovered that four other children had been trafficked. The charity organization said they stopped facilitating adoptions in 2015, and even then, they never accepted money. When Sister Bernadette Moriau was 27, she was diagnosed with chronic sciatica. The pinched spinal nerve eventually put her in supportive equipment, including a corset and leg brace. Since the condition prevented her from walking normally, she sought conventional surgeries. However, four operations could not fix the problem. In 2008, the nun was 69 years old. She decided, like so many other desperate pilgrims, to visit the holy shrine of Lourdes near the Pyrenees mountains. The spring is famous for miracles. Afterward, Sister Bernadette returned to her parish in the north of France. It was not long before she experienced something extraordinary: A warm relaxation spread through her body. She heard a voice commanding her to remove the supportive equipment. For the first time since her diagnosis, the nun’s condition was gone. After performing physical examinations and meetings with Church officials, a medical committee in Lourdes stated her cure could not be explained by science. In 2018, the event was declared the 70th miracle of the holy shrine.